Find the best 7 day tours and trips starting from Hanoi. Choose from 93 tours - we've found the most popular time to visit is in May with the most number of tour departures. 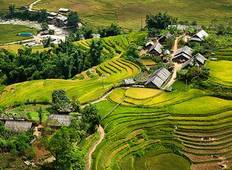 "We booked the Hill Tribes of Sapa 7 Day Private Tour through Crossing Vietnam Tour...."
"This trip to Mai Chau was the BEST day I’ve had in my three weeks in Vietnam. Lucy..."
"Me and Zoni are very happy with the trip, we are pleased with our accommodation,..."
"Excellent tour. Great guide and we thoroughly enjoyed every minute."